I'm bringing out a new ebook! However, the most exciting thing is that, for a few days, you can download it completely F.REE from Amazon. 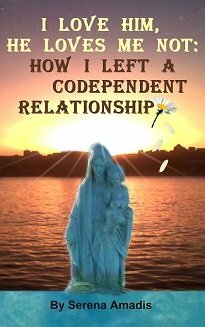 "I Love Him, He Loves Me Not: How I Left a Codependent Relationship" will be available for F.REE on Amazon for a limited time. I'm not too sure of the dates of the promotion, since this is the first time I'm promoting something on Amazon, but I will be sure to let you know in a future newsletter. It will be soon, though. 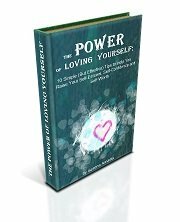 After the promotion ends, you will still be able to acquire the book for immediate download from Amazon. But it won't be f.ree anymore. And since I have promised a f.ree excerpt from all the ebooks that I put out, available exclusively for my beloved Subscribers, of course, there is one for this ebook too. And now here is the featured article. Souls don't become fragmented as a result of normal traumas, hurts or upsets. A person's soul wouldn't usually become fragmented because the person broke up with their sentimental partner, or suffered the loss of a loved one. People's souls don't usually get broken up because the people were betrayed by someone that they loved, trusted or cared about. Souls don't become fragmented even if the person committed suicide. However, souls CAN become fragmented. Sometimes a person literally loses a part of themselves, that is, a piece of their own soul, when they feel so so so guilty or so much in debt to someone that they decide to, literally, give a part of themselves to that person. At times a person may voluntarily give away a piece of his own soul if he feels like he is willing to do anything, absolutely ANYTHING, to keep another person by his side. Including, giving away a piece of his own soul, in order to keep the other person happy. You might give away one of your soul facets if, like Keanu Reeves' character in "Devil's Advocate", you actually go to the length of "making a deal" with some shady character, in order to get something that you really really really want in a way that isn't ethical or morally correct. Another way that people can lose soul parts is when they have been the victim of a nuclear bombing. So we know that right at this moment, there are many victims of Hiroshima and Nagasaki, many of whom are probably not living on the earth plane (that is, alive) at this moment, that are missing parts of their own souls. Souls are immortal, but if you lose too many parts of your soul, you quite literally BREAK APART, and then you, as a soul, really really can cease to exist. The danger of losing so many soul facets that you actually become extinguished forever, however, is really quite infinitesimal. We are all endowed with hundreds upon hundreds of soul facets, and we'd REALLY have to be super mixed up and all out of ourselves to give away so many of these facets that we actually break up and disappear forever. I've been doing Akashic Records readings for a few years now, and I can assure you that in this time, I have NEVER EVER encountered a SINGLE PERSON who was missing even one single facet of his soul. That is how rare and uncommon it is to lose a part of your soul. So it is very very very highly unlikely that you would have lost any little bits of your soul, even if your soul has been alive for eons and eons and eons, travelled across all the expanses of space and dwelt on a dozen planets. However, in the very very very rare case that you should have happened to lose a few slivers of your soul, there most definitely IS a solution. You can tell if an Akashic Records or psychic reader is a scam artist if they proclaim that you have, indeed, lost some fragments of your soul, but they can restore these fragments to you FOR A PRICE (usually a very large sum of money). An ethical reader should only charge for the reading itself. If, in the course of carrying out their reading, they should discover that you are missing some of your soul facets, it's only ethical that they should also carry out the ritual to restore these facets to you as a part of your session, free of charge. If you actually discover that you are missing a little bit of your soul, in reality, a talented or well-trained healer, such as a Soul Realignment practitioner, or a healer who does healing work through the Akashic Records, can easily restore it for you. In Soul Realignment training, we learnt a ritual to restore lost soul facets to a person, no matter where in the universe they happen to be. It's simple to perform, but time consuming, and requires the active participation and cooperation of the client. However, I'm sure other methods of soul facet restoration also exist.